Primitive air-breathing fish, whose direct ancestors first appeared around 400 million years ago, show mechanisms controlling the heart which were previously considered to be found only in mammals – according to a new study. Mammals show an increase in heart rate when breathing in and a decrease during expiration – a cardiorespiratory process known as respiratory sinus arrhythmia (RSA). This process and its underlying control mechanisms have been considered by many scientists to be solely mammalian but the present study questions this assumption. Scientists in Britain and Brazil studied the South American lungfish, Lepidosiren paradoxa, and discovered that systems enabling this primitive vertebrate to control blood flow during bouts of air-breathing have close similarities to those identified in mammals. Lungfish are members of an ancient group of lobe-finned fishes (Class Dipnoi), having a continuous fossil record originating in the Devonian period around 400 million years ago. This was a time when the first vertebrates crawled on to land to give rise to amphibians and over succeeding millennia reptiles, birds and mammals. With their proto-lungs and proto-limbs, lungfish represent the earliest stage in the evolution of air-breathing vertebrates. They inhabit tropical, freshwater pools and slow-flowing rivers, which often contain very low levels of dissolved oxygen and can disappear during the dry season. The lungfish shares a periodic breathing pattern with the terrestrial vertebrates, rising to the water's surface at regular intervals to ventilate its lung-like air-breathing organ and depending exclusively on these lungs for oxygen uptake during drought. Led by experts at the University of Birmingham and the Federal University of São Carlos (UFSCar), in São Paulo, the international team published its findings in Science Advances. 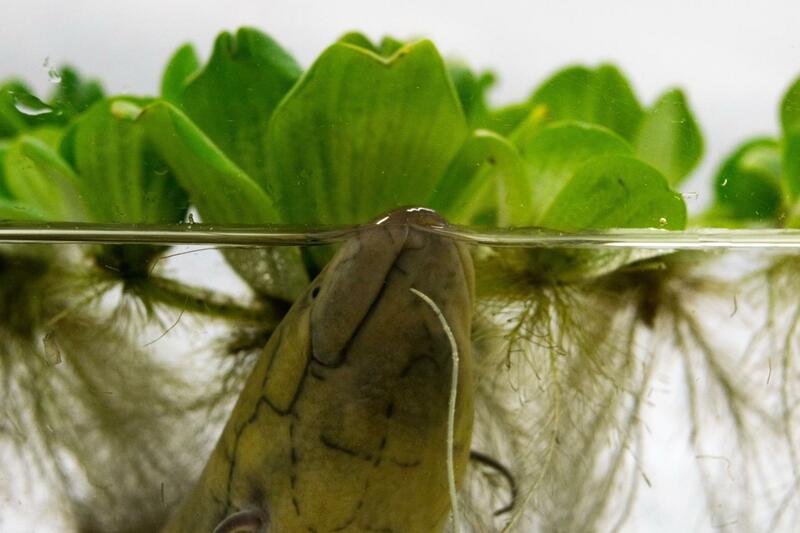 Professor Ted Taylor, from the University of Birmingham, said: "When lungfish gulp air at the water's surface, their heart rate instantly increases – signalling a diversion of blood to the creature's lungs. "This is possible because the animal has an undivided heart, enabling the proportion of blood diverted to the lungs to be varied; unlike mammals, as we have a completely divided heart with equal volumes of blood pumped separately to lungs and body with each heartbeat. "Our study established a clear function in lungfish for these increases in heart rate in maximising oxygen uptake during each air breath that has not been definitively demonstrated for RSA in mammals. This suggests that it may be a relic of their link to ancient amphibious ancestors." Professor Taylor added that "The lungfish has a relatively complex control system which generates these respiration-related changes in heart rate, with properties that anticipate those described for mammals. "We found that these include multiple locations for nerve cells in the brainstem that innervate the heart with insulated fibres that conduct rapid impulses, causing an instantaneous cardiac response to each air-breath." This illustration in a fish with a proven ancient lineage of a highly evolved system controlling variations in heart rate suggests that its evolution was necessarily linked to the advent of air breathing over primitive vertebrate lungs rather than the much later appearance of mammals. This understanding questions assumptions over the primacy of mammals made by some biomedical physiologists and many psychobiologists, demonstrating that "primitive" mechanisms though early are not necessarily simple. The University of Birmingham is ranked amongst the world's top 100 institutions, its work brings people from across the world to Birmingham, including researchers and teachers and more than 5,000 international students from over 150 countries.